Chemokines and their receptors play a pivotal role in lymphocyte trafficking, recruiting and recirculation. They act through seven transmembrane G protein-coupled receptors. The chemokine system is increasingly recognized to play an important role in lymphocyte biology. Chemokine receptors are G-protein-coupled receptors (GPCRs) with seven transmembrane (TM7) spanning a-helices belonging to the rhodopsin superfamily. They have an N-terminus outside the cell, three extracellular domains, three intracellular loops and a C-terminus in the cytoplasm wich contains serine and threonine phosphorylation sides. These receptors bind their corresponding ligands with high affinity. Unusualy for members of the TM7 receptor superfamily nearly all chemokine receptors have multiple high-affinity ligands for a single receptor. CCR5 for example binds CCL3 and CCL4 as well as CCL5. Binding of a chemokine to its specific receptor on the cell surface activates a G-protein coupled signal transduction cascade. Finally the activation of protein kinases results in chemotaxis towards the source of the chemokine. Based on their ligand specificity, chemokine receptors can be divided into two major groups, CXCR and CCR, based on the two major classes of chemokines. The C-C Chemokine receptor highlighted in this article were assigned to the cluster of differentiation (CD) group of cell surface molecules during the 8th HLDA workshop in Adelaide 2004 as CD191 (CCR1) to CDw199 (CCR9). CCR1 was the first CC chemokine receptor identified and binds multiple inflammatory/inducible (see inducible gene) CC chemokines (including CCL4, CCL5, CCL6, CCL14, CCL15, CCL16 and CCL23). In humans, this receptor can be found on peripheral blood lymphocytes and monocytes. There is some suggestion that this chemokine receptor is restricted to memory T-cells within the lymphocyte pool. Fig. 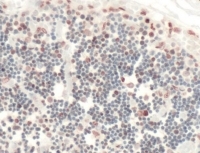 1: Immunohistochemical staining of spleen lymphocytes using anti- CCR1 antibody SP4001P. CCR2 can interact with CCL2, CCL8 and CCL16 and has been identified on the surface of monocytes, activated memory T cells, B cells, and basophils in humans, and also in peritoneal macrophages in mice. Fig. 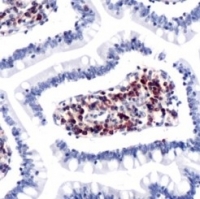 2: Immunohistochemical staining of Spleen (Lymphocytes) using anti- CCR2 antibody Cat.-No. SP4086P. CCR3 is a receptor for multiple inflammatory/inducible CC chemokines, including CCL11, CCL26, CCL7, CCL13, CCL15, CCL24 and CCL5 that attract eosinophils, and CCL28 that attracts B and T lymphocytes to mucosal tissues. It is most highly expressed in both eosinophils and basophils, but can also be found in Th1 and Th2 cells and airway epithelial cells. Fig. 3: Immunohistochemical staining of nasal mucosa (allergic rhinitis) using anti- CCR3 antibody Cat.-No. SP4002P. CCR4 is expressed on Th2 T lymphocytes and is up-regulated by T cell receptor activation. However, some reports suggest a role for this receptor also in trafficking of dendritic cells. The CC chemokines CCL3, CCL5, CCL17 and CCL22 signal through this receptor. Fig. 4: Spectral Confocal Microscopy of CHO cells using KH-4F5 antibody (Cat.-No. DM1232). CHO cells were transiently transfected with an expression vector encoding CCR4. Binding of KH-4F5 was visualized with a FITC-conjugated secondary antibody (green). Actin filaments are labeled with Alexa Fluor-555 Phalloidin (red). Cell nuclei are stained with DAPI (blue). CCR5 is expressed on several cell types including peripheral blood-derived dendritic cells, CD34+ hematopoietic progenitor cells and certain activated/memory Th1 lymphocytes. This receptor is well defined as a major coreceptor implicated in susceptibility to HIV-1 infection and disease. This receptor has several CC chemokine ligands including CCL2, CCL3, CCL4, CCL5, CCL11, CCL13, CCL14 and CCL16. Fig. 5: Immunohistochemical analysis of paraffin embedded rectal carcinoma sections, staining CCR5 in cytoplasm, DAB chromogenic reaction. Cat.-No. AP23286PU-N.
CCR6, a receptor for CCL20, is expressed on unactivated memory T-cells and some dendritic cells. 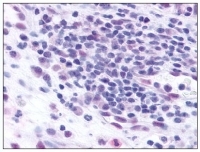 CCR6 is also expressed on Th17 cells. Fig. 6: CCR6 polyclonal antibody. Cat.-No. 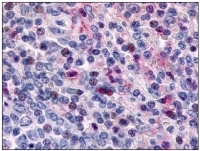 AP23322PU-N.
CCR7 is a highly important receptor with a role in trafficking of B and T lymphocytes and dendritic cells to and across high endothelial venules and positioning those cells correctly in T cell zones of secondary lymphoid organs. Its ligands include the related chemokines CCL19 and CCL21. Fig. 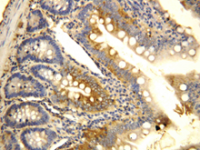 7: AP15408PU CCR7 antibody staining of Human Small Intestine. 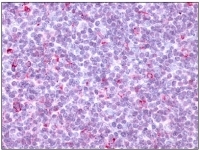 CCR8 is associated with Th2 lymphocytes and is therefore found predominantly in the thymus (in humans) although some expression can be found in the brain, spleen, lymph node, and monocytes at the nucleotide level. The ligands for this receptor are CCL1 and CCL16. Fig. 8: Human thymus stained with anti-CCR8 antibody. Cat.-No. AP15409PU-S. Fig. 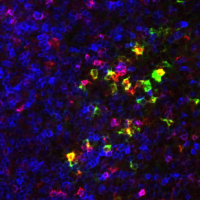 9: Immunofluorescence staining of mouse medulla of a mesenterial lymph node using CCR9 antibody AM01391SU-N (Blue: CD3, Green: IgA, Red: CCR9). CCR10 is receptor for CCL27 and CCL28 that was originally called orphan receptor GPR2. 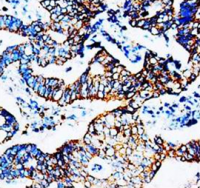 CCR10 has been implicated in inflammation of the skin, and has been shown to recruit regulatory T cells to mucosal layers. Fig. 10: Immunohistochemical staining of tonsil using anti- CCR10 antibody SP4015P. Fig. 11: Immunhistochemistry analysis in human heart (Formalin-fixed, Paraffin-embedded) using CCR11 / CCRL1 antibody Cat.-No. SP4097P. Since OriGene Technologies was founded in 1998 we have increased the numbers of antibodies to chemokines and their receptors every year. Today we can offer an abundant antibody panel to chemokine receptors for various applications like Western blotting, immunohistochemistry, immunofluorescence, flow cytometry and other immunological detection methods. CCR1 antibody, CCR2 antibody, CCR3 antibody, CCR4 antibody, CCR5 antibody, CCR6 antibody, CCR7 antibody, CCR8 antibody, CCR9 antibody, CCR10 antibody, CCR11/CCRL1 antibody.